Feel a buzz in your pocket? That's Mars calling your iPhone. 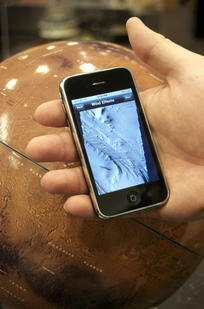 Thanks to a new — and free — iPhone app, users can have images of Mars delivered daily to their device. The images come from an Arizona State University-designed camera onboard NASA's Mars Odyssey orbiter, and they include every kind of feature there is on the Red Planet. The iPhone app is available through the iTunes Web site. The app comes from Kate Gordon-Bloomfield, a software developer and codirector at LittleCollie Ltd. in the U.K. A programmer for about 10 years, she says, "I became interested in developing software for Apple's mobile platforms after getting an iPhone and MacBook Pro." She wrote the app on weekends and evenings. Gordon-Bloomfield is also a self-described "complete space nut," adding, "I have always had an interest in space exploration. I even went to space camp when I was in my teens." The camera providing the daily images of Mars is the Thermal Emission Imaging System, or THEMIS. It was designed by Philip Christensen, Regent's Professor of geological sciences in the School of Earth and Space Exploration, part of ASU's College of Liberal Arts and Sciences. A multiband instrument, THEMIS makes images of Mars at infrared and visible wavelengths. Its latest accomplishment is the completion of a global portrait of Mars at a resolution of 100 meters (330 feet). Besides being available through the iPhone, the THEMIS images of the day are accessible on the Web at http://themis.asu.edu/image_of_the_day. The site also has links categorizing the Martian features by type. Choosing to create an app for the iPhone was a natural, says Gordon-Bloomfield, a graduate of ASU who majored in religious studies. "The iPhone, iPod touch, and iPad are a great market," she says. The Blackberry? Maybe not so much. 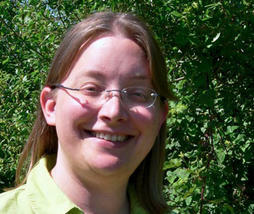 "While the Blackberry has a large user base," she says, "its primary focus is enterprise-tier business users. I don't see the THEMIS Mars app as meeting their needs." What about the Android? Gordon-Bloomfield replies, "The Droid's a budding platform. If its market percentage increases, this app would make a great project for that platform." Meanwhile, Gordon-Bloomfield is weighing updates. "I've been thinking that loading the images could be improved by loading a lower-quality image initially and then loading higher and higher quality and detail as the user zooms." Explore Mars with your iPhone using images from the THEMIS camera on NASA's Mars Odyssey orbiter. An ASU grad in religious studies, Kate Gordon-Bloomfield's space interests led her to create an iPhone app that delivers images of Mars to the device.